Seeing as the Earth is a puny nugget of metal sitting atop a nearly 2000 mile-thick mantle of high-pressure flowing rock, it’s no surprise that the rock occasionally seeps out, either slowly or explosively, through the surface. It’s pretty cool to see the magma glowing beside Sicily’s nighttime lights, though. The streaks from Etna’s lava flow are visible in the bottom left quadrant, isolated from the nearby glow of the 300,000-person city of Catania. The tallest volcano in Europe at over 10,000 feet (3,000 meters), Etna has been erupting since late February. It slowed down and flared up several times since then, most dramatically, in an explosion caught on tape by a BBC crew that injured ten last week. This behavior isn’t new: Etna has in fact been erupting on and off for a very, very long time. 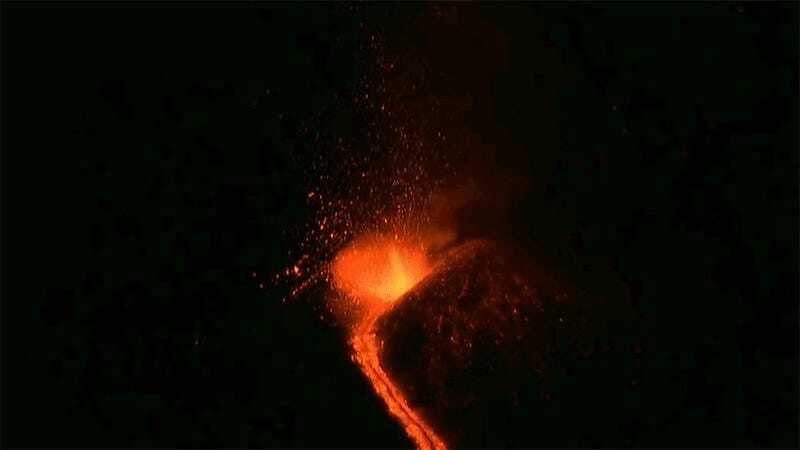 Records of observations go back two and a half millennia, and the volcano has been erupting on and off for hundreds of thousands of years, volcanologist Keith Putirka, from California State University in Fresno, told USA Today. The volcano likely exists as the result of the African and Eurasian tectonic plates interacting nearby, according to a paper published in Nature. So, go enjoy the view of some of our round Earth’s incredible features from space, or wherever else you happen to be. Just don’t get too close.